A prosciutto pizza is no surprise, but this recipe combines flavors and heat to please even the most sophisticated palates. A recipe from our Prosciutto di Parma Specialist Chef Sara Jenkins’ Short Stack Cookbook, this special creation is complimented by the sweetness of fresh peaches yet the surprising kick from the jalapeños that make it anything but a typical pizza. Enjoy any time of the year as the star of a summer party or a quiet night in with the family. Looking for a perfect beer pairing to match? 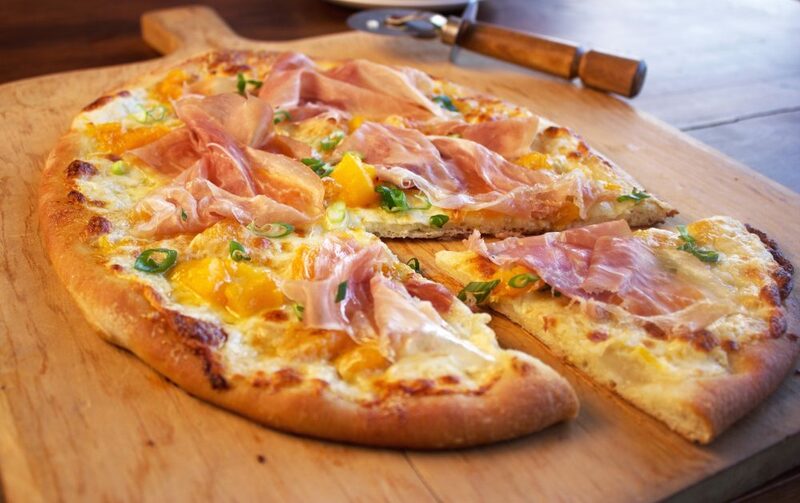 Try a German Hefeweizen or other beer pairings to balance the prosciutto pizza yet compliment the spicy peach jam. In a large bowl mix flour and yeast. Add water; stir until mixture begins to form a dough. Stir in oil and salt. Cover with a kitchen towel. Let rise until doubled, about 1 hour. When the dough has doubled, place it on a lightly floured work surface. Spread the dough in to a rectangle about 2 inches thick. Pick up the two ends and fold them over into the middle as if you are folding up a letter. Turn the folded dough 90 degrees and repeat 2 or 3 more times, rotating the dough after every fold. Return the dough to the bowl; let rest another 15 minutes or so. Repeat the folding and resting again. Repeat folding and resting at least 3 more times (up to 6 for optimal results). After the final turn, return the dough to the bowl; cover with plastic wrap. Chill overnight. In a large heavy-bottomed saucepan combine peaches and lemon juice. Toss. Add the chili. If using a habanero, add it whole, if using a jalapeno, halve it and add both halves. Cook, over low heat, stirring frequently, until the peaches begin to fall apart, about 20 minutes. Add the sugar, cook, until the sugar is dissolved and the peaches have broken down to a jam-like consistency. Remove the chile and discard. Let jam cool. Cover and chill until ready to use. Divide the dough into 4 pieces; form each into a ball. Let rest, covered with a cloth, 20 minutes. Form one of the balls into a flattened disk, about 8 inches wide. Place on a lightly oiled baking sheet. Divide the burrata into quarters. Tear one of the quarters into pieces and scatter over the dough. Drizzle with 1 tablespoon of the olive oil. Sprinkle with 2 tablespoons of the grated cheese. Dot with about 2 tablespoons of the jam. Bake until the dough is crisp and golden brown. Before serving, drape with 4 to 5 slices of the prosciutto and sprinkle with 1/4 of the scallions. Repeat with remaining dough and toppings to make 4 pizzas. Cut into wedges and serve. Store bought pizza dough can also be used. You will need 2 pounds of dough.